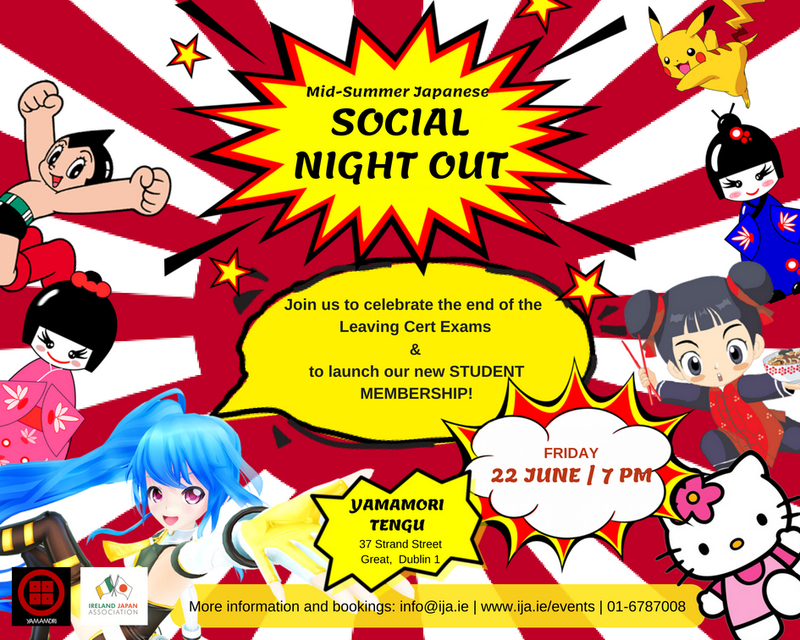 To celebrate the end of the Leaving Cert Exams & to launch our new STUDENT MEMBERSHIP (€30 per year), join our Mid-Summer Japanese Social Night Out. It will take place on Friday, 22nd June at 7 p.m. at Yamamori Tengu, Dublin. Join us for a great night out, celebrate end of the school together with your friends and meet like-minded people! You will also have a great opportunity to chat with members of the IJA and find out all about Student membership and its benefits. Light refreshments and snacks will be offered upon arrival by the IJA (drinks must be purchased separately). If you wish to attend, please RSVP by Wednesday, 20th June by email: info@ija.ie or call 01-6787008.